Nearly every major area in America has its own unique environmental problems, from factories and power plants to contaminated lakes and rivers. But Los Angeles offers an important look at the way pollution is affecting public health simply because there are so many cars on the road. Los Angeles has the worst traffic in America, and it’s second only to Belgium as the worst in the world. Drivers spend around 60 hours a year stuck in congestion, and the problem isn’t a lack of roads. According to Environmental Health Sciences, at least half of the population of LA lives within one mile of a freeway, and the consequences of this exposure have been acute. Birth defects, chronic conditions in children, increased cancer risks, and heart attacks all result from bad air quality. The 405 at rush hour can not only ruin your day, it may literally be able to kill you. Pregnant women who are exposed to traffic pollution gain a 12 percent greater chance of developing preeclampsia, a serious condition that raises the blood pressure and can lead to seizures during pregnancy if not treated. It also puts them at serious risk for low birth weight and birth defects. Breathing in carbon monoxide while pregnant increases the baby’s chance of brain disorders and spina bifida, and it also means the child has a much greater chance of developing asthma. USC researchers have also linked pollution to autism, claiming a mother that lives within 300 meters of a freeway is twice as likely to give birth to autistic children. 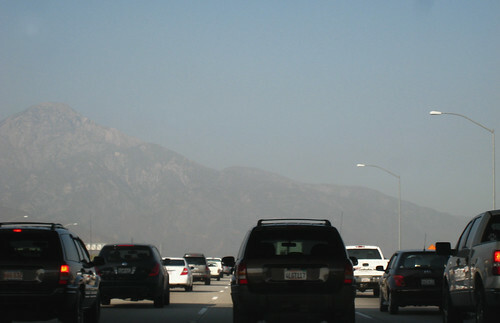 A disproportionally high number of young children in LA have asthma, and particles from cars and trucks affect their respiratory and pulmonary health early on. 90 schools in the greater Los Angeles area are too close to freeways, and many of them feature classrooms equipped with air filters and refuse to let the children play outside on days with particularly bad air quality. But the attempts to limit exposure to emissions may not be enough. Long-term exposure to traffic fumes can directly impact the way a child’s lungs develop, literally making it harder to breathe in and out. But nitrogen oxides and particulate matter also cause an increase in lung cancer in adults, and pollution is said to be one of the major reasons there are more lung cancer patients than ever who have never been smokers. Today, 160,000 people die of lung cancer every year, and 60 percent of diagnosed cases are in people who have quit smoking or never once picked up a cigarette. In the European Study of Cohorts for Air Pollution Effects, which tracked participants in nine countries for 13 years, researchers discovered that for every 5 micrograms per cubic meter of pollution, lung cancer risk shot up 18 percent. 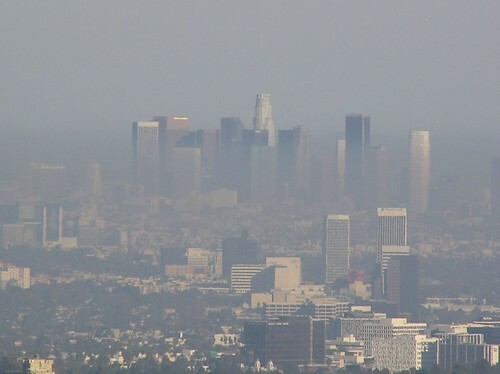 The most polluted cities in America are all in Southern California, including LA, Fresno, Merced, and Bakersfield. Most lung cancer patients in LA were exposed to PAH pollutants, which are formed by the incomplete combustion of wood, coal, and diesel. Much has been written about the increasing risks of heart disease in America, but scientists are only now beginning to recognize that traffic pollution may play as least as big of a role as obesity. According to a study published by the Public Library of Science, pollution actually increases the thickening of arteries that supply blood to the head and heart. Short-term exposure to pollution can aggravate an already-existing heart condition and cause heart attacks, which is why Los Angeles County sees an increase in hospitalizations and death on days with the most smog. 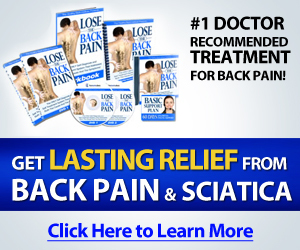 It can also cause strokes, arrhythmias, and heart failure, especially in elderly patients. Doctors also believe pollution plays a part in high blood pressure and diabetes, which are the main indicators of a heart condition developing. Medical professionals at Health Testing Centers have seen an increase in diseases facing factory workers, dockworkers, and others who are exposed to fumes on a daily basis. Heart disease is the number one killer of men and women in America, and it’s estimated someone dies of a heart condition every 33 seconds. Los Angeles is an amazing city where thousands of people move every month to take advantage of the great weather, cultural diversity, and wealth of opportunity. But the many advantages of the city come with at least one major disadvantage – America’s most congested highways. The world is waking up to the importance of protecting against diseases caused by pollution, and LA is a perfect place to start. Author Karen Alton blogs for testing centers where diagnostic and routine medical testing are performed. Follow her on Twitter @HTCKarenA.